With satellites, instrument data, and a range of other tools scientists are able to identify many other changes occurring around the planet. 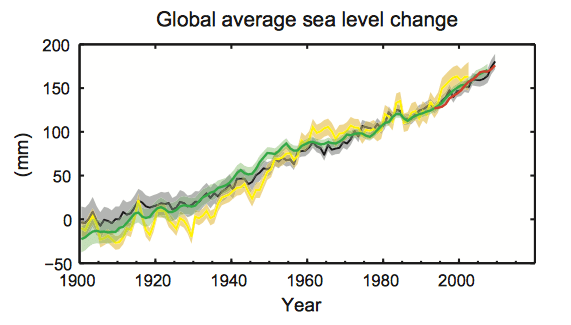 The global average sea level has risen approximately 170 centimetres (1) over the course of the twentieth century. As with the global average temperature trends, the global average sea level is rising at an accelerated rate in recent years. There are various factors responsible for contributing to sea level rise, such as thermal expansion, glacier melt contribution, and the Greenland and Antarctic ice sheet melt contribution. When heated, water expands. As the Earth’s atmosphere warms, so do the oceans. Simply put: the atmosphere is warming, causing the oceans to warm. Because the oceans are warming, they are expanding, which causes the sea levels to rise. The fact that sea levels rise in response to ocean warming is not good news, considering that global average temperatures are expected to continue to rise in the future. Another problem is that the oceans experience a lag in warming, due to their strong thermal inertia. This means that even if temperatures were to stop rising and stabilize, sea levels will continue to rise for some time into the future. Melt water from the Greenland ice sheet, the Antarctic ice sheet and from glaciers all contribute to rising sea levels. As temperatures warm, ice sheet and glacier melt increases. The world’s ice sheets and glaciers hold an enormous amount of water, and thus have the potential to contribute significantly to future sea level rise. Sea ice plays an important role in the climate. It reflects sunlight. (The albedo effect). As sea ice diminishes in extent, so does its ability to reflect radiation back from the surface. This speeds the warming experienced in the area, as more solar radiation is absorbed by lower albedo surfaces such as open water. Sea ice extent in the Arctic is measured by satellite. Each year, the area of the Arctic covered by sea ice increases in the winter and then shrinks in the summer. 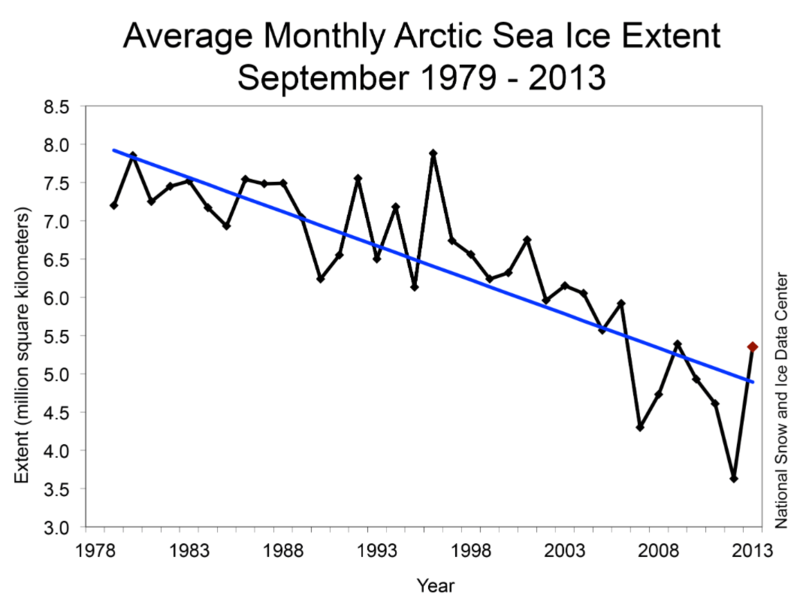 Around the third week of September each year, the sea ice reaches its summer minimum extent. At the current rate of disappearance, it is expected that the Arctic seas could experience almost completely ice-free summers by mid-century. The retreat of mountain glaciers is among the most visible effects of climate change (Fig 3) (4). Glaciers have been losing massive amounts of ice recently and the rate of loss has been increasing. The average rate of ice loss from glaciers around the world, excluding glaciers on the periphery of the ice sheets was about 226 Gt/yr (Gigatonnes per year) from 1971 to 2009, and about 275 Gt/yr from 1993 to 2009 (3). Glaciers provide an important fresh water source for many parts of the world. A loss of mountain glaciers can impact fresh water availability for many, including parts of Western Canada. 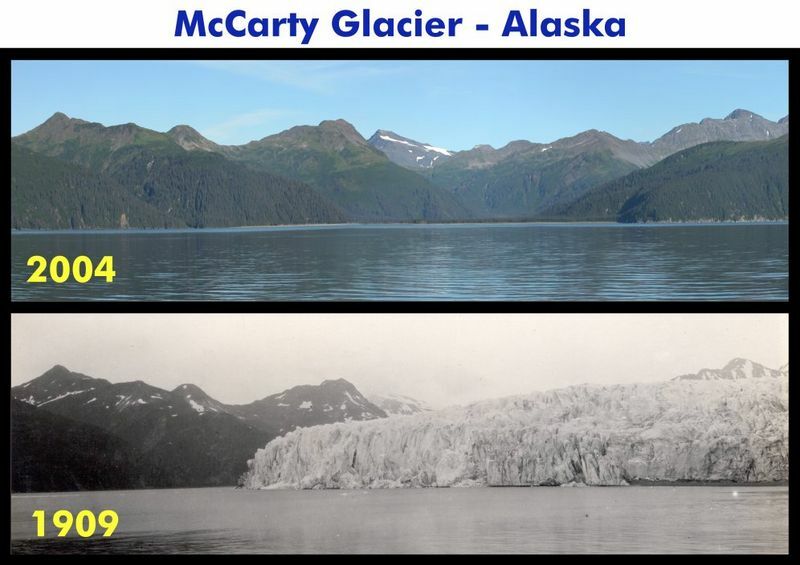 Melting glaciers are an important contributing factor to sea level rise. As the climate warms, glaciers retreat at an accelerated rate, thus compounding the problem of rising sea levels. Permafrost is the layer of soil or rock that remains below freezing throughout the year. 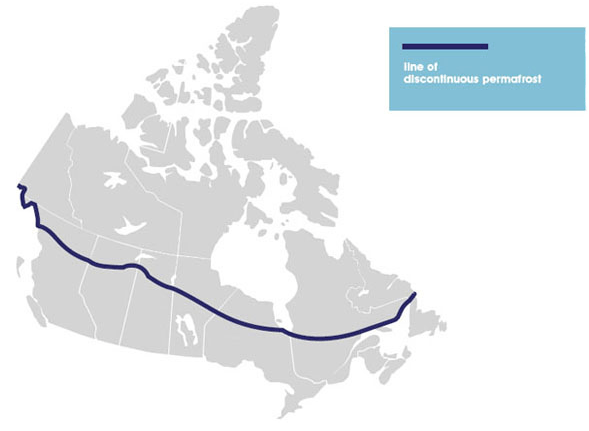 Permafrost is found at higher (more northerly) latitudes (Fig 4) (5), where average surface temperatures are low enough to support this persistence of frozen ground through the summer. Because permafrost is dependent on surface temperatures, warming in the north greatly affects permafrost stability. Thawing permafrost has grave implications for the regions affected, from the collapse of structures built on the permafrost to vegetation changes and animal behaviour. Alarmingly, thawing permafrost threatens to release vast amounts of methane. Methane is a very powerful greenhouse gas. Releasing methane results in more warming resulting in more methane in a positive feedback loop.